Welcome to my inaugural post in my little corner of the inter-webs. This day kicks off the beginning of what I hope are many more posts to come for my blog — Just a Little Bit of Clarity. So why am I writing about pizza for my first post? Like with most things, my taste buds changed over time. Once I found out there were other possibilities outside of Papa John’s or Domino’s, I actually found out not all pizzas need to be filled with grease or cardboard crust to taste delicious. And here I find myself enjoying a fabulous margherita pizza that I’m going to share with you today. First things first. 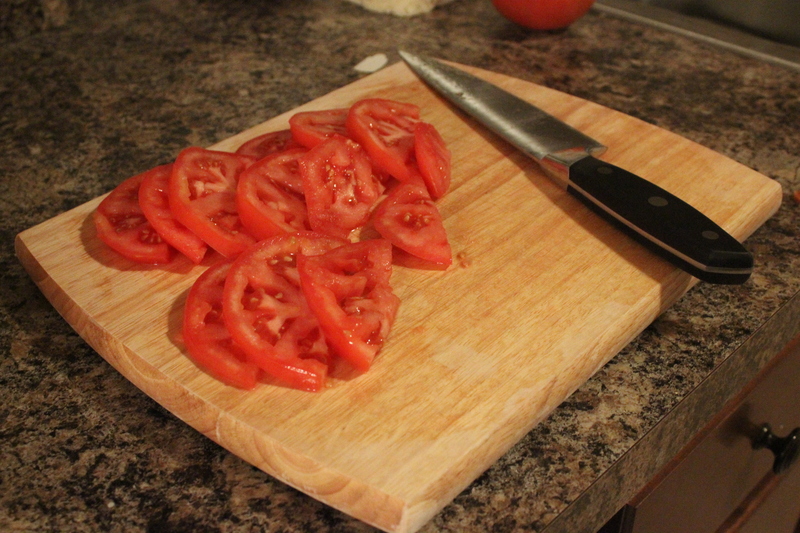 Cut the tomatoes into thin whole slices. The next step is up to your preference. 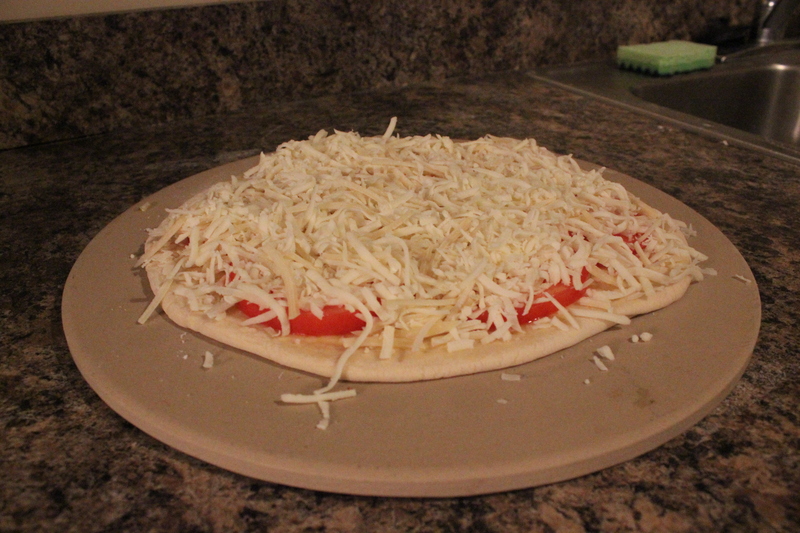 I decided to cut my whole sliced tomatoes in half so I could fit more on the entire pizza. (Side note: I also used to hate tomatoes. You could say I was a bit of a picky eater, but thankfully my taste buds have grown up quite a bit.) You’ll also want to mince your garlic now into very small pieces. It’s important to make sure your garlic is evenly diced. There’s nothing worse than eating something and biting into a large chunk of garlic. It needs to blend together with the other ingredients so it can enhanced the flavors. Before we go any further, make sure to preheat your oven to 400 degrees. That way it’ll be finished by the time we’re done topping our pizza. The next step is the most fun (other than eating the final product, of course). I live not to far away from this quaint, little business that sells its own special Italian products. From meats to cheeses, pastas and, yes, it’s own pizza dough. 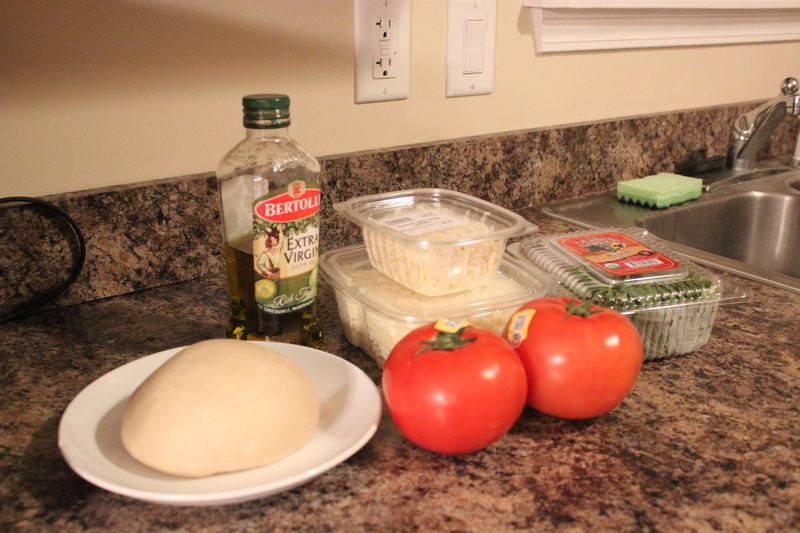 You can certainly make your own pizza dough or buy a precooked crust from your local grocery store. What I like about getting premade raw pizza dough is it’s right in the middle of two extremes. 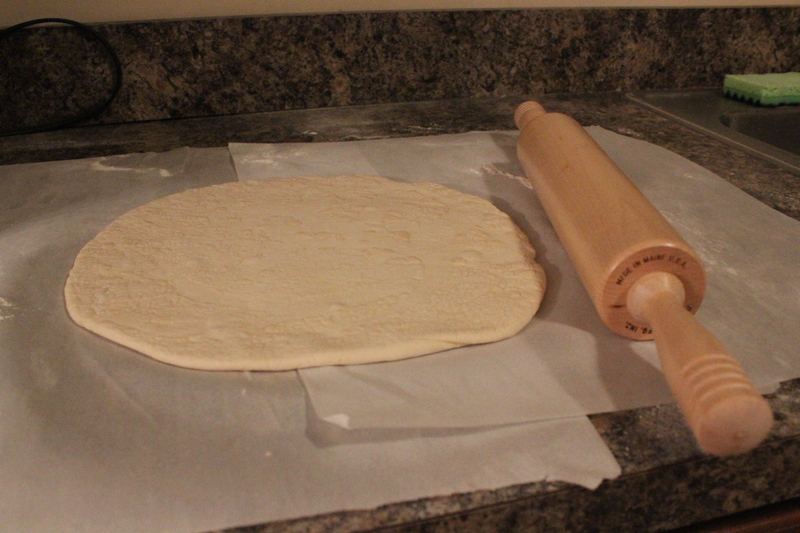 I started out by laying down some parchment paper to help with cleaning and rolling out the dough. Next, make sure you have plenty of flour. Rub a little on your hands and rolling pin, and sprinkle a good amount on the parchment paper. 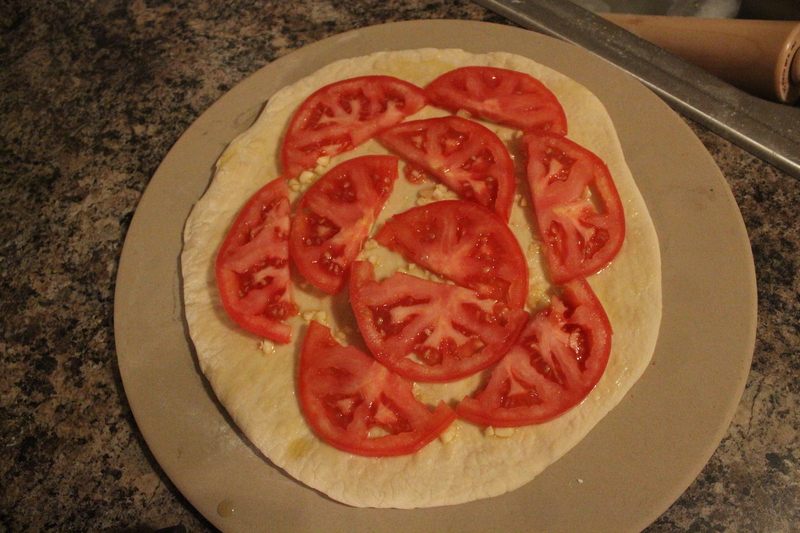 Lay out the pizza dough on the paper, rub some flour on the top and start rolling it out. Once it seems like the pizza dough isn’t rolling out enough, pick it up with your hands and start tossing it around, stretching the edges as your turn it in your hands. Don’t worry about stretching it in half. 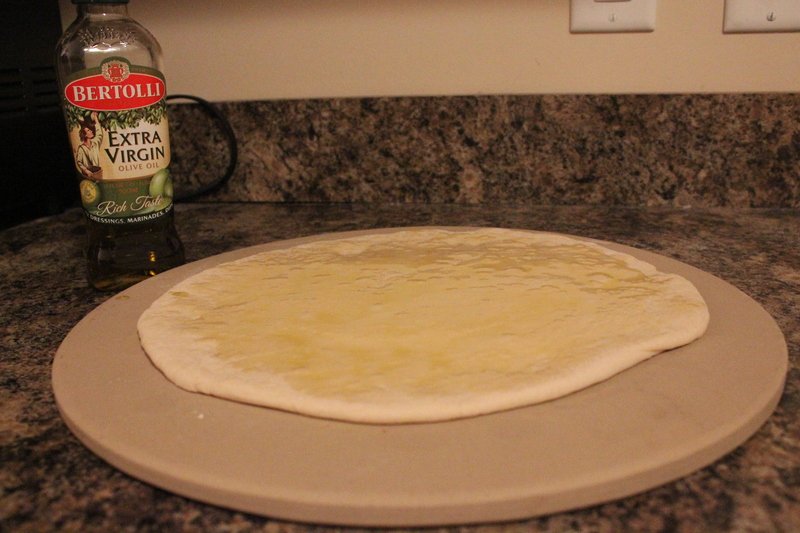 The pizza dough should hold up and (if made properly) should be strong enough to spread out without splitting. Repeat the rolling and tossing process until you have a size you’re happy with (I made mine at about 10-12 inches with a medium to thick crust). Once we have our pizza dough rolled out to the desired size, I highly recommend placing it on a pizza stone or pan before you place the toppings on it. It makes it so much easier rather than attempting to transfer it over later. First, you’ll want to brush some extra virgin olive oil over the crust, leaving about an inch of crust around the rim untouched. 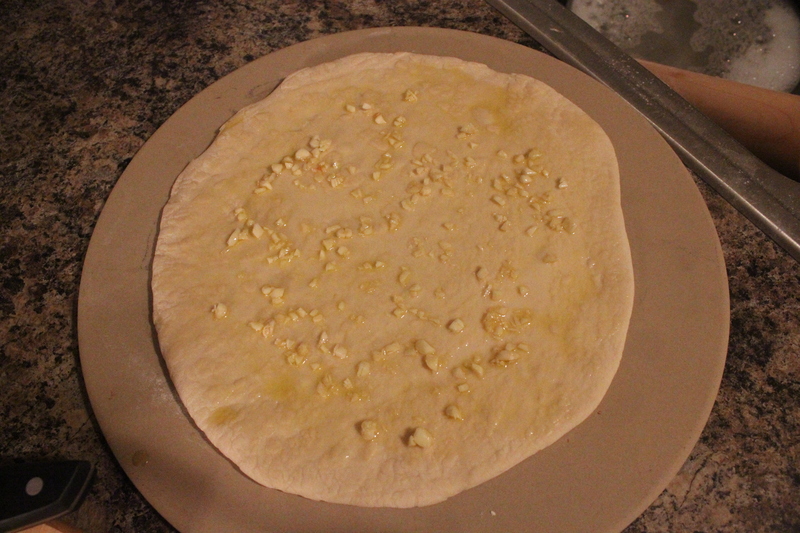 Then, add the garlic, making sure to spread it out evenly (see my garlic comment above.) After that, place the sliced tomatoes on the pizza, starting from the outside and working in until the dough is all covered. Again, make sure to leave about an inch of space around the edges. Finally, we can add the cheese. I would recommend mixing the cheeses together in a large bowl first so it’s incorporated well. You can add as much or as little cheese as you want, although the more the better. The oven should be preheated now to 400 degrees. Since we already made the pizza on the stone, you can transfer it right to the oven. Make sure to place it on the lowest rack and cook for about 25-30 minutes or until the edges are golden brown, the cheese is melted and the bottom of the pizza is cooked through. 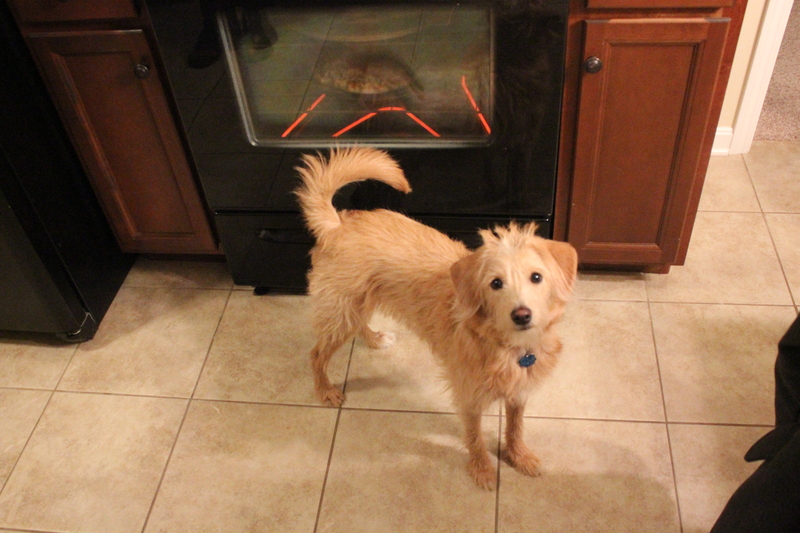 Also above, you’ll see a photo of our dog Winston, eagerly waiting to grab a bite out of my pizza, I’m sure. He’s always curious to see what I’m doing, especially if it involves food, so he’ll be making a regular appearance in all of my blog posts to come. Once the pizza is cooked all the way through, add the basil to finish it off. You can leave them whole or tear them up into smaller pieces depending on your preference. And voilà! A pizza even I couldn’t pass up. The last part is definitely the easiest — cut out a slice, bite in and enjoy.